If you wish to upload your images to an FTP server as a one time operation (“upload and forget about them”) then you should export your images. Once the images have been exported there is no further connection between Lightroom and the exported images - your originals remain safe withing Lightroom of course. You will be presented with the FTP Publisher export dialog. 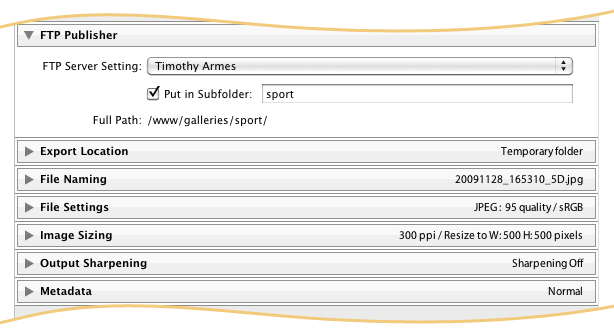 Once you have defined your FTP settings you may optionally choose a sub path in which to export your images. This allows you to create a preset with a top level path (perhaps to your user account) that you can reuse frequently, and still be able to upload to different subfolders. The full path is displayed for your convenience. Once you're ready press Export and your images will be uploaded to your server.